Don’t let the simple look of the powerful Makita 1806B 10.9 amp, 6-3/4-inch planer fool you. It’s a rugged and powerful tool that’s ideal for timber framing. You can easily dress timbers and use this tool to square up timbers before layout. Here are some of the most important things to know before you buy it. One of the best things about this planer is its precision. You can adjust the depth easily for consistent and razor-sharp accuracy on each beam. The cut quality is excellent for tougher woods like oak and makes quick work of softwoods. You’ll be pleasantly surprised at how easy this tool is to control when you use it. Since it’s so stable and heavy, you won’t notice much difference between cutting soft or hard woods. There’s minimal vibration because of the weight and sturdiness of the tool. The result is a much smoother surface the first time around and in a much shorter amount of time. If you buy the tool new, it also comes with a blade set, multiple rule guides, a wrench, a sharpening holder assembly and a really nice wooden case. For some people, one of the minor disadvantages of this tool may be its weight. If you’re expecting a light tool, you’ll be disappointed. However, you’d be even more disappointed if you bought a cheap lightweight planer. Part of what makes this tool so precise and easy to control is its solid construction. If you want to avoid arm fatigue, the best way to use it is to make small cuts. Also, don’t forget to wax the base and keep it clean. This planer is definitely not the cheapest and may not be immediately affordable for shoppers with tight budgets. 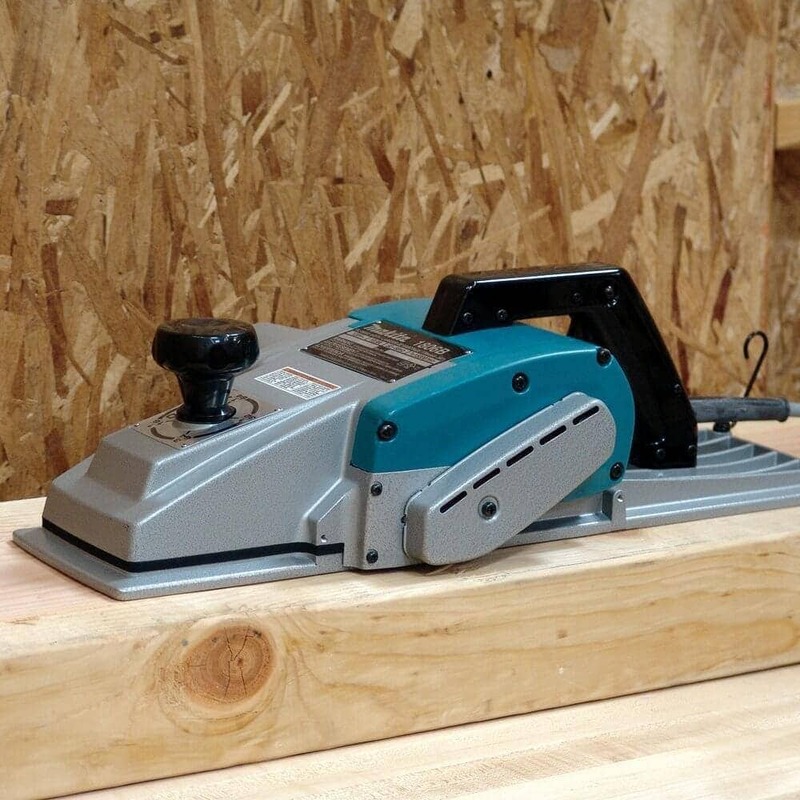 Even if you need to postpone a little while to make a purchase, this tool is definitely worth the wait. .
With the long-lasting durability of a Makita and the overall usefulness of this power-packed planer, your investment is worth every penny. You could buy a different smaller planer for one-half of the price. However, the performance and quality you’d get from it would be about one-third of what you get from this planer. Also, Makita offers a great year-long warranty if you buy the tool new. If you’re considering buying it, if you need an above-average planer and if you have the funds, you absolutely should buy it. This tool does everything it’s supposed to and will probably even exceed your expectations. Also, it’s built to be resilient enough to last a long time whether it spends most of its time on your tool shelf or on the work table. A workout indeed but worth it. Thanks. The biggest drawback to this tool is that it does not have a carbide blade. Disassembly for sharpening is a multi-step process, and getting the tool back in running order will take about 40 minutes. For this reason alone, I have used it less and less in my timber-framing. When rough sandpaper on an 8″ circular wheel won’t cut it fast enough, I just use a 4″ electric planer with reversible carbide blades. Overall, a better and cheaper solution. I have used an 1806B for 18 years now–this is not an unconsidered post. This is a quality tool, but it has its shortcomings, which were not (other than the weight) noted in the review above. Thanks for your feedback and great point. I have not found that I needed to change the blades out that frequently to be a hassle however, it has mostly been used on softwoods and not a hardwood. I have my tried and true 3 1/2″ planer as well, it is a workhorse, but it is handy that you can clean up something that is 12″ wide in two passes especially, when tiring to square something up. Good point about hard woods and soft woods. I do quite a bit of oak, as it turns out, and even the pine I work with is pretty knotty.. I have the funds to buy the 1806B but am anxious about the cost to buy the KP312. The majority of my timbers are 8x10s with the occasional 10×14. My issue is that I am a busy with my career and timber framing is a hobby (building 3 timber structures over the next three years), so I’m looking for efficiency. Brice’s comment on the two pass on a 12″ timber makes is sound easy. Can a beginner like myself get a good enough face on a 10 or 14″ face with the 1806B? I am also milling my own timbers with a logosol chainsaw mill and although the finish is pretty good I do want a nice smooth finish to avoid collecting dust. Appreciate any tips and advice. The big Makita KP312 is a great machine and worth every penny of it, but with only 3 frames I think you could get away with the 1806B. You will have overlap marks in the middle of the timbers that you will need to sand out. This one or the 12″ Makita… I have access and worked with eh 12″ model, but I sometime think it is over kill on 5 to 10 inch timbers, what would you buy if you could buy only one? The 12″ is an overkill beast of a tool but well worth the money if you can swing it. It weighs in close to 50 lbs but make quick work of cleaning up timbers. Planning on reviewing the Makita and Mafell in a future article. Is it a trouble to do 8 or more inch timbers with the planer? It can be a little troublesome at times, you will need to make two passes and the cuts can be off from one another, if you can afford it and are cutting more than a couple frames it go with a 12″ planer otherwise, this one will get the job done.